﻿ Matthew 19:26 And looking at them Jesus said to them, "With people this is impossible, but with God all things are possible." 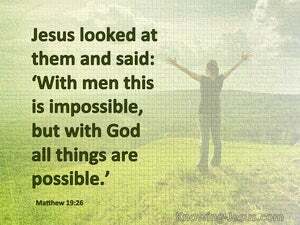 And having looked, Jesus said to them, With men this is impossible, but with God all things are possible. Jesus looked at them and said, "This would be impossible with men, but everything is possible with God." But Jesus looked on them, and said to them: "With men, this is impossible; but with God, all things are possible. And Jesus, looking at them, said, With men this is not possible; but with God all things are possible. but Jesus looking at them, said, however impracticable this is to men, all things are possible to God. But Jesus, looking on them, said to them, With men this is impossible; but with God all things are possible. And Jesus looking on them said; With men this is impossible; but all things are possible with God. But Jesus looked at them and said, "For men it is impossible, but anything is possible for God!" But Oesus looking upon them, said to them, With men this is impossible; but with God all things are possible. And Jesus having looked up said to them, With men this is impossible, but with God all things are possible. But Jesus looked at [them] [and] said to them, "With human beings this is impossible, but with God all [things] [are] possible." 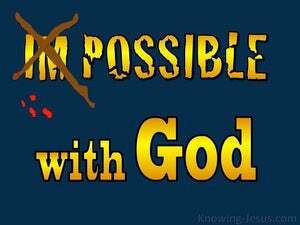 But Jesus looked on them and said to them, With men this is impossible, but with God all things are possible. Jesus beheld them, and said unto them, "With men this is impossible, but with God all things are possible." Jesus looked at them and said, "This is impossible for men, but anything is possible for God." "With men this is impossible," he said, "but with God all things are possible." But Jesus, fixing his eyes on them, said, With men this is impossible; but with God all things are possible. But Jesus looking on them, said, With men this is impossible; but with God all things are possible. And, looking intently, Jesus said unto them - With men, this is, impossible, but, with God, all things are possible. 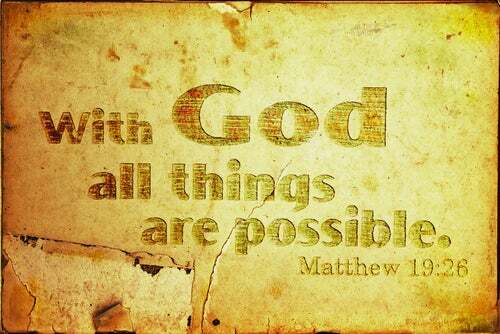 And Jesus looking upon them, said unto them, With men this is impossible; but with God all things are possible. But Jesus looked at them and said, "This is impossible for men, but anything is possible for God." But Jesus, looking on them, said to them, "With men this is impossible, but with God all things are possible." 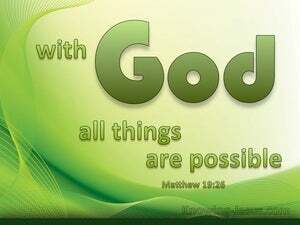 But Jesus looking upon them said unto them, With men this is impossible, but with God all things are possible. 25 When the disciples heard this, they were very astonished and said, "Then who can be saved?" 26 And looking at them Jesus said to them, "With people this is impossible, but with God all things are possible." 27 Then Peter said to Him, "Behold, we have left everything and followed You; what then will there be for us?" "Thus says the LORD of hosts, 'If it is too difficult in the sight of the remnant of this people in those days, will it also be too difficult in My sight?' declares the LORD of hosts. "Behold, I am the LORD, the God of all flesh; is anything too difficult for Me?" Salvation belongs to the LORD; Your blessing be upon Your people! Selah.